The majority of our guests prefer to bring their own bikes as the familiarity and comfort of riding your own bike can make a big difference in the mountains. #1 Long Haul: If you are travelling via several flights then the likelihood of the airline losing your bike increases disproportionately. #2 Test Ride Your Next Bike: Corvara is one of the few places in the cycling world where you can hire a bike better than your own for a similar cost to bringing your own bike. 3# Gearing: We recommend at least a 28 tooth as your biggest cog on your rear cassette, as guides we favour 30 or 32! Why? because you are either climbing or descending in the Dolomites – you rarely need “big gears” as there is very little flat or false flat riding. So it makes sense to have more climbing gears. All the local bikes for hire in Corvara with have at least a 28 on the back. 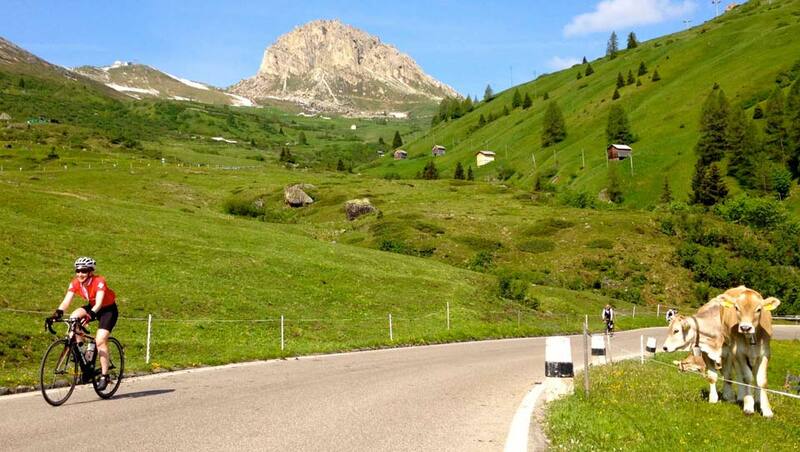 For our Maratona dles Dolomites holiday based in Corvara we recommend Breakout Sport who rent Pinarello Dogma’s and top end Scott’s just a two minute stroll from our hotel. If they are fully booked check out the other options in Alta Badia. If you do choose to hire a bike remember to pack your own pedals, saddle and helmet for comfort and send the bike shop your bike dimensions too for a better fit. #1 Familiarity: The challenge of riding in the Alps is made easier of you are on the bike you’ve trained hard on. It fits like a glove, you know it’s little creaks and issues and most of all your bike has worked as hard as you have and deserves a holiday as much as you do! #2 Reduced Stress: Worrying about adapting to a hire bike before your trip can be stressful and if you are still concerned when your climbing on it in the mountains you will be wasting energy too. Is it the thought of using a bike box that worries you? These bike box packing tips and bike box discounts from our Partners might help change your mind!